What specific upper-body strength training (weight lifting) exercises should you stop, avoid – Or modify – when you have a Tennis Elbow OR Golfer’s Elbow injury? Whether you listen to the podcast, watch the video or read the post, I’d love to hear from you in the comments below if there are any other exercises you’re wondering about – Or if there are any others that have caused or worsened your Tennis Elbow injury. 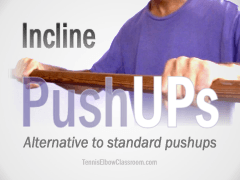 Should you be doing Tennis Elbow-SPECIFIC Exercises now? – What’s the right timing? And what are the goals? – What Are The Goals of Exercise In Tennis Elbow Rehab? 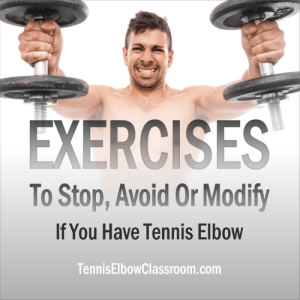 Exercises to avoid if you have Tennis Elbow. Whether you stop when it hurts! How much weight you use! Whether you warm up first! And how many sets you do per exercise. I see the reasoning in this, as having a dumbbell in each hand (rather that one bar in both hands) to do say, biceps curls, will require the wrist muscles to do more stabilizing and work harder, which apparently is to be avoided in this view. Perhaps this is correct, but then again, I think it may depend on what stage you are at in your recovery. WHY would you avoid challenging these same muscles by asking them to stabilize your wrist as you use dumbbells to work other muscles like your Biceps, Triceps or Pecs? 1 – You favor your weaker side when using a barbell or fixed bar in both hands on a cable. Is this a good thing when you have Tennis Elbow? But what if your injury is on your stronger side? 2 – You can also lift more weight with a barbell / bar than you can with dumbbells and that is not a good thing when you have Tennis Elbow. Push Ups, Pull Ups, Chin Ups and Dips are typically “all or nothing” in that you can’t vary the amount of weight (only the repetitions) because it’s normally your full body weight. AND to adjust it as needed as you go through your routine. Especially if you can use the bar on a press/squat machine, or similar, so you can hold the bar and keep your wrists in a more neutral position and not fully flexed the way you typically do them on the floor. OR skip the Push Ups for a while, do plank and a light Bench Press with a barbell or dumbbells instead. They are inherently more challenging because the “lever” is longest with your arm straight; the weight either begins or ends held at max distance from your body. I don’t even know what all of these exercises are called, but they involve a weight stack with cables that run through adjustable arms and pulleys, and you can attach handles and various other things on the ends of the cables. You can do dozens of different exercises with these machines, including Pec Flys, Lat Pulldowns, Triceps Extensions and Biceps Curls many of which are completely fine. The most potentially troublesome one is the “Cross-Over Lateral Raise and Shoulder Extension” (you basically start with straight arms crossed over your lower body and then go into an “X-like” position with arms over your head. 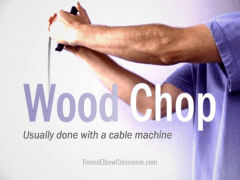 Followed closely by the ones that mimic a golf swing, or a tennis volley – One of which is called the “Wood Chop” – involving a lot of torso rotation and arms held mostly or fully extended and static. Since, as a class, many of these exercises challenge your core and shoulder stability more than dumbbells and barbells do, you might be better off for reasons already stated to hold off on these altogether as well. Also, avoid using this equipment to do the specific exercises described further down, like Deltoid Rasises. Long Lever Exercises are inherently more stability challenging, but there is another class that “raises the bar to another level” so to speak – Although this class of exercises is done without a bar. TRX is the most popular example of this. These exercises, done using a pair of long straps, typically attached to a bracket in the wall or ceiling on one end – with handles on the other, require very high levels of stabilization. Novices tend to hold the handles in a “death grip” as a way of compensating, too, which is the last thing you need with Tennis Elbow. If you haven’t been doing this kind of exercise, don’t even think about starting – Until your injury is a distant memory. If you have been doing this kind of workout, I think it would be wise to stop until your elbow is better. But I’m hearing that some of my members actually got their Tennis Elbow from doing TRX, so just be careful, and if and when you start, EASE into it! Or they can be done with the elbow flexed to varying degrees – often at 90 degrees, which is a little less challenging. And, conversely, the more extended (straightened) it is the greater the load. 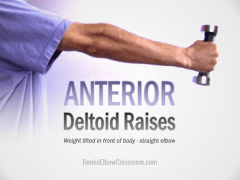 Anterior (forward) Raises (for your Anterior Deltoid) are usually done with elbows fully extended in front of your body, which makes them very challenging to the Wrist Extensors. Although this exercise is less challenging to the Wrist Extensor Muscles it might be best to avoid it in the early stages of recovery. Just do the classic “Bent Over Row” instead. And then as you start making progress in your recovery, try adding the Posterior Deltoid exercise first, followed by the Anterior Deltoid Raise, and finally the Lateral Deltoid Raise. 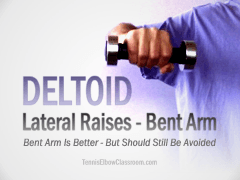 The most challenging aspect of the Lateral Deltoid Raise is the fact that your palms must face the floor at the top of the motion where the resistance/weight is greatest. This puts the maximum load and stress on your Wrist Extensors, because the back side of your wrist is facing the ceiling. “Supination Curls” – with dumbbells (starting with thumbs facing forward and palms facing each other at bottom and then turning palms up as the weight is lifted) – my favorite. The palm up grip should be the least challenging, (slightly more with dumbbells) followed by Hammer and then Supination curls, with Reverse Curls being the most challenging and to be avoided. The reason being that in the palm-down grip / Reverse Curl, your Wrist Extensors (“Tennis Elbow Muscles”) are under maximum load. I have come across more than one weight lifter who got their injury from doing these. Don’t Do Upright Rows PERIOD! If you’re doing this exercise already, my advice would be to stop it – And not just while you have Tennis Elbow – But forever. It’s a terrible exercise that jams the hell out of you’re A/C joint and serves no purpose that can’t be achieved with other exercises. But for the purposes of T.E. it’s not ideal for the same reasons as Reverse Curls: Very heavy load on your Wrist Ext. Muscles. In General, Don’t Just Train Your Major Muscles! It’s very important to strengthen your supportive, smaller, “stabilizing” muscles – And not just your major muscle groups, like your quads, biceps, triceps, etc. Especially if you’re a Tennis or Golfer’s Elbow sufferer and you’re working on strengthening your Rotator Cuff, which you absolutely should. Is This Good Treatment And Exercise Advice? And here’s another article from ‘The NY Daily News’ on Tennis Elbow from a Doctor who authors a column on running, tennis and sports injuries. But I have to disagree with some of the exercises he recommends for rehab, (and the frequency = too often!!) first and foremost being Reverse Curls! And another called “Unbalanced Rotation,” which involves holding the end of a small dumbbell at arms length, with full elbow extension, and then making circles with it. I like the idea of doing these with the elbow flexed (bent) at 90% – Just not with a fully extended arm (which is the same position you use for the Anterior Deltoid Raise I warned against earlier. What are your thoughts on tricep exercises? Awesome website, can’t wait to dig into it. I am a massage therapist for about 15 years. I have tendonotis in both arms, but my right arm in much worse. Any advice when doing my massages? I do use my forearm and elbow on my deep tissue clients, they wouldn’t have it any other way. Thank you for all the info. I will enjoy learning more. Thanks, Saika! I can’t recommend much beyond watching your body mechanics while you’re working, schedule rest time and breaks (if you’re in control of your schedule) and get worked on yourself as much as possible! Is dead lifting safe with tennis elbow. Dead lifting with significant weight? If so, that’s a lot of gripping, so I wouldn’t call it “safe” – but you may be able to get away with it. Personally, I would probably skip it in favor of squats and other similar exercises that don’t require so much grip strength. Thanks for all the tips, I’ll have to watch this more carefully soon! I found wrist weights very helpful – with those I can do biceps curls, reverse biceps curls and deltoid raises. Mind you I use only a very small weight on each wrist but more repetitions then normally and so far it’s been fine. Basically everything where one has to grip a bar, a barbell and probably a kettle bell (haven’t even tried) is really bad, finding a grip-less alternative was the solution for me. I have had my share of brachioradialis strains along with tennis elbow. The only trick I came up with that I didn’t see in your video was the use of cables with the strap attachment that you velcro around your limbs. I use them on my wrists for large list of exercises, therefore being able to keep training biceps and triceps without a huge strain on the wrist muscles. Thank you for making these videos they can really help a lot of people! Otherwise, long term, my concern is that you’d be bypassing part of your kinetic chain: If you’re not strong enough to hold the bar/handle (weak grip – Tennis or Golfer’s elbow preventing full use of your grip) then are you strong enough to be doing that exercise with that amount of weight? Hi there! You seem to have some of the best information online about tennis elbow and its underlying mechanics. I have searched high and low online with very limited results to my issue. I have a great interest in gymnastic strength training, and over the course of the last few months have developed a case of tennis elbow. I have laid off exercises on equipment such as parallettes or my homemade rings, as they seem to put the most stress on my wrists and elbows due to the need for more stabilization. I have been doing work on the floor, where my hands are flat on the floor, such as pushup variations, handstand work, planche leans and L sits. None of these exercises hurt while I perform them, but my pain hasn’t gotten any better…. If anything, it feels like the “pump” generated from these exercises makes the area swollen and thus more tender, but I can’t tell if it’s actually contributing to the problem or not. So I’m wondering if you know how or why the extensors and possibly the supinator muscle would still be aggravated by exercises where they don’t feel like they’re being engaged much, if at all. I’ve read to avoid exercises that put stress on the elbow (which is a lot of gymnastic strength training) but I’m having trouble understanding how the lateral epicondyl is involved in this. My first concern is whether you are actually experiencing swelling (the accumulation of fluid in an area due to inflammation or edema) which could suggest an acute injury process – or whether that’s a sensation (swollen) you feel that doesn’t represent actual fluid build up. It could also be that your Wrist Extensors are compensating for an underlying (and not locally symptomatic) weakness/instability in your shoulder, and the Lateral Epicondyle, being where these muscles originate, is where you’re getting the bulk of your symptoms. Thanks for sharing the information that you have found helpful in your recovery of tennis elbow!! As a physiotherapist, I see tons of patients with tennis elbow (aka lateral epicondylosis); of these patients, many of them do not want to stop doing upper body exercises! I agree with your point that you have to stop an exercise if it hurts. The pain is your body signalling that you are causing tissue damage and really if this is happening you are just defeating the ultimate goal of getting better! 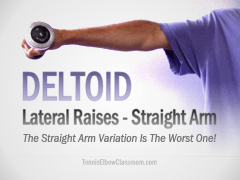 In my opinion, participating in any upper body exercise with a dumbbell or a barbell puts increased stress on your wrist stabilizers (including your forearm extensors) and it is typically this tendon that is injured in tennis elbow. Now it depends on how much tissue damage there is and how acute and painful your condition is. Ultimately, my recommendation is to stop any upper body exercise that puts any stress on your wrist/forearm stabilizers for 4-6 weeks while the tissue has a chance to heal. I also recommend that you participate in a rehabilitation program that includes shockwave therapy and eccentric strengthening of your forearm extensors. There is great evidence showing that using a theraband flex bar (start with yellow or red) can help significantly with tennis elbow injuries. Look this up and read the research. The research studies are solid and I can say that my patients all benefit from this type of strengthening. Laslty, during this hiatus in your upper body workout regime, I recommend you consider working on your upper back muscles. Perform Ys, Ts and Ws over a ball. Often these muscles are lacking and that’s why your poor forearm extensors have to work extra hard. I hope this information helps. All the best in your injury recovery and rehabilitation. Stay positive. I’m finding that gripping the dumbells is quite a strain, so I’ve switched to using ankle weights on my forearms instead. it helps a lot! That’s a great idea! (If you happen to have ankle weights around or want to buy a set.) – I suspect some health clubs may also have them but, then again, I’ve never seen any around at mine. (Perhaps they are kept specifically for certain classes and locked up by the instructor after class.) To anyone else reading this and liking the idea: You may need to ask around at your gym if you want to try this there. Even in high-end clubs like mine, (Bay Club Marin) small equipment like this seems to go missing. The “Triceps Ropes” are forever disappearing. Good article Allen. Thx for the info. I’ve heard some different things about icing the tennis elbow. Could you clarify as to weather it actually helps and is good or bad in speeding up recovery. i’m an avid crossfitter, and recently have developed tennis elbow in BOTH arms. it hurts to do pull-ups, push-ups, hand stand push-ups, power cleans, snatches, etc. i am feeling discouraged..i am icing, resting, but cant seem to ‘slow down.’ do i STOP, and rest my upper body completely, and just do the bike and leg work. dont wanna lose my gains and strength, but dont want to be chronically injured!!! Hi Heather, Sorry to hear about your injury. I would be discouraged, too, I’m sure! (I am getting the impression that it seems a little to commonplace for Crossfitters to get Tennis Elbow, sadly. Might have to do a post on that soon.) Anyway, be sure to read my “Don’t Ice It!” post here – I’ve just been updating it with new sources. Aloha…Thank you for the great information. What about swimming freestyle w/ tennis elbow? High elbows/ever so slightly wrist bent, pulling against the water. Could this be aggravating the elbow and avoided??? Thank you! Watch out for cold though. I would really put the heat to my elbow after swimming to get the blood flowing well if the pool is cool as they often are. your thougth on Key hole surgery or any other surgery which will help me forever. I had an MRI and got BURSITIS. I can’t advise you about whether surgery is right for you or not, but I think I can safely say that if they remove your Olecranon Bursa, via Key-hole Surgery, you won’t be getting Bursitis in that elbow again, but that won’t change the fact that it was caused by irritation and trauma (likely impact related stress from the boxing, right?) and if you continue with that high-impact activity you will still run the risk of traumatizing other parts of your elbow and/or wrist and shoulder. Thanks heaps again and it’s very informative for every one i beleive . your valueable advises. Hi Allen, I have read your website with great interest and you give some good advice which is very similar to that of my physiotherapist so thank you for that! I have had tennis elbow for around 9 months now which came about suddenly and during that time I have ceased doing any upper body work at the gym. My work involves quite a bit of typing and I am generally an active and hands on person. I have been doing daily exercises (which my Physio recommended) to build up my strength again (which has worked) starting with 2kilos and slowly working my way up over 9 months to 4kilo dumbbells using them to move my wrist in slow motion up and down whilst keeping my arm straight and then doing the twisting motion slowly again with the dumbbell. I thought after all this time I would try to start my boxing again, which I love, and after 10 minutes of this, the pain came back again the next day. Does this mean that I will never be able to box again as part my exercise regime? My trainer said that dead lifts should be OK but I am now cautious to try them. It is so frustrating to not be able to do any upper body work for fear of the pain re-occuring. Can you suggest exactly what type of upper body work can be done to assist with my weight loss training? Thank you kindly. I started doing TRX a month ago in a supervised class twice weekly. I am very fit, but slightly (10kg) overweight. I have developed tennis elbow on my left arm. (I am right-handed). I suspected the TRX classes for causing it, so I Googled “tennis elbow TRX” and I immediately found your blog. I am going to stop TRX and see if I recover. I have nothing against TRX. It’s a versatile system that doesn’t require a lot of equipment and really forces you to use your core and your stabilizer muscles to the fullest. Sorry to hear you ended up injured after only a month. All the best to you in your recovery! I started to workout about three months ago and things were going well. Few weeks after I started working out, I noticed my right forearm “exactly where you describe the pain from TE would be” started slightly aching. It was really a very minor discomfort that I considered good exercise pain. The discomfort did not interfere with any of my activities and was really negligible. About 20 days ago, I took a trip and I did not have access to a gym, so I did not work out during the past 20 days. Around midway in my trip, I started feeling the pain increasing, but it was still very light. It kept increasing where now I can feel it is a problem now. The pain is noticeable, but still very bearable. I have not done any significant workout other than walking on the past twenty days, and the pain is increasing. I am ready to go back to the gym, but I am worried that I will hurt myself further. 1- Why did the pain increase when I stopped working out? I am reading into your content and I appreciate the time and effort you have put into creating it. I am an avid gym user for a weights routine (heavy compound lifting of 4-6 reps by 3x sets) (also Yoga and spinning) but have noticed a slow development of pain in both elbows which has now become painful at all times, not at the gym while exercising but at night and the following morning. I have cut down from a 4 day spilt routine to a 3 day routine for more recovery but am still getting discomfort. It is getting to the stage where I am thinking I may have to stop any upper body work at all. I have stopped lateral raises, bicep curls and tricep extensions. Is it ok to continue (much lighter) with bench press / shoulder press and Barbell row’s? I am thinking I may have to just train legs / abs for a few weeks otherwise but would like to recover the upper body gently. Any advice most welcome and I am not realising that it may have been sloppy wrist form that caused this issue. Thank you so much for the informative videos and ebook. Hi Rich, If I were you I would only do upper body weights twice a week and dramatically cut the weight down – maybe even lighter than what one might think of as a “maintenance level” – and discontinue the lateral raises as you are. Better to play it safe, trying to be content that you’re still “in motion” and keeping some conditioning – rather than being forced to stop completely due to a more serious injury. I workout 3 times a week, Usually Mondays and Thursdays are full-body workouts with a focus on hypertrophy (6-12 rep range, then I bump up the weight once I can do 3-4 sets of 12). I do a pretty slow tempo on the negative portion of all exercises and flex the target muscles on the positive portion. Saturdays are reserved for rotator cuff strengthening exercises (I had a shoulder injury 18 years ago). Anyways, I have a pain that seems to float somewhere in my elbow joint, but I can for sure feel a pain in my right arm right where a phlebotomist would take blood. Sometimes I swear I feel it radiating up my bicep, and sometimes I feel it on the outside forearm. What I do now for sure though, is that It hurts whenever I try to pick my daughter up from the ground or if I try to do “front-raises” with her. It also hurts right after I put my phone down after talking on it for a few minutes. I had a massage on the elbow tendons and it helped. I also switched to a neutral grip on the pull-ups, and it seems better, but not healed. Does this sound like tennis elbow? My grip on deadlift and other barbell exercises has always sucked, some sites say to strengthen the grip, does that make sense? When I look at my arm musculature in the mirror, I can’t help but notice that my triceps are way bigger than my biceps. Could some of these elbow issues that people have be due to muscle imbalances? And since some other sites want you to do everything with neutral grip (trap-bar deadlift etc.) why wouldn’t hammer curls be good then by this logic? Some sites say to avoid barbell curls, some say to do those instead. I am so confused right now, but I really want this nagging pain to go away. I would appreciate any feedback. Thank you! What about ropeskipping and double unders? I’m an archer (olympic recurve) and I have tennis elbow in my bow arm. Have you got any experience with archers and TE in the bow arm? What are your thoughts about keep shooting? It does not hurt when shooting, can be a bit more stiff next day, but sometimes it’s less stiff next day. It would be great if you could ( or anyone) could post a 3 or 4 day upper body work out plan that excludes the exercises to avoid, but works as much of the upper body as we can. That’s really hard to say, Joseph. I could see it going either way, but I would tend to lean toward the idea that those handles might help by allowing the wrist, elbow and shoulder joints to move and adjust a little more to the pushup motion without forcing those joints to only move in one plane. I think you’ll just have to test it out by trial and error, though, ultimately. Good luck! Hi there, Ill just leave a few tips that your readers my use with regards to reducing the strain on the extensor muscles in the forearm. With regards to back exercises where I have to grip a bar in order to do a row or lat pulldown I use wrist grips that curl around the bar in order to reduce the tight grip stress involved in these exercises. With regards to side lat raises I use a wrap that I put as close to the elbow as possible and attach it to a cable machine so that the elbow is at a ninety degree angle when raising and lowering the elbow, this pretty much eliminates any stress on the wrist extensors. In terms of longer term treatment I do the towel wrap exercise where I have my hands in front of me at a waist height position. I then wring the towel so that right fist is facing towards me and the left hand is facing away from me. The exercise is a static hold at close to maximum force. The hold is released and my hands swap position for another five seconds hold. I do this twice a day for a week and increase the hold by five seconds for another week. I build this up over time to a static hold of one minute. 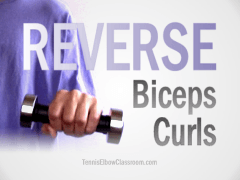 The exercise is painful but, has worked for me every time I have had tennis elbow. Medical advice has been not to stop training but to initially reduce the work load to about sixty percent of what I normally do and gradually build up the load as the elbow gets better. I use both oral anti inflammatory medication and cream that is applied to the affected area. I agree, and believe that would probably be best for most Tennis Elbow sufferers. Good protocol! Great article, thanks! I do a lot of push ups, military presses with dumb bells and a rowing machine in Orange Theory. You’ve talked me into taking a break from push until I’m healed. But how about the rowing machine and military presses? Do you think they are aggravating my elbow? Thanks, Gary! My concern with the rowing machine (you mean the cardio machine, I assume, and not the “seated row” weight lifting machine) is that it involves a lot of repetitions and is grip and forearm intensive. Not the greatest properties when you’re recovering from Tennis Elbow. I don’t do or recommend military presses at all. I think they put an unnecessary load on the Rotator Cuff – potentially leading to impingement or fraying of the Supraspinatus Tendon. I think bench press is okay – (better with dumbbells than bar) You can do anterior raises to target your Anterior Deltoid, not going above shoulder height to avoid excessive wear on the Supraspinatus Tendon. I enjoyed your exercises to avoid video and learned a number of my regular upper body exercises should be avoided. I have a couple of questions: Are rope pull downs for tricep exercises bad. Palms are facing each other, exercise starts at elbows at about 80 degrees to fully extended and back to 80 degrees. It doesn’t seem that it would strain wrist extender muscles. How about a rowing machine? That doesn’t seem to me to stress wrist extenders. I do overhead presses on a machine using the handles where my palms face each other. Does this seem ok? What about chest presses sitting on a machine and pushing the bar out? Thanks for your help. What positions should you avoid in yoga? I’ve only just discovered your site and what a gold-mine of information! Apologies if you have already answered my question elsewhere, but I wanted to know what your recommendations are specific to yoga. I have struggled with Tennis elbow in my right arm for nearly 1 yr and it has restricted my yoga practice, specifically I find plank, downward-facing dog, and chaturanga causes pain, especially after my yoga practice. I also find swimming aggravates tennis elbow. 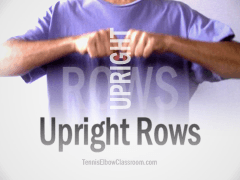 I’d love to hear your comments on how to practice yoga when recovering from tennis elbow, especially the positions requiring weight bearing on arms. Is there a video in the pipeline for this? Although, it focuses on the subject of Elbow Hypermobility / Hyperextension issues and Yoga. I am a 63 year old male. I’ve been doing Strong Lifts 5×5 for about a year and a half and I’ve only recently developed TE – mostly in my dominant arm. Since I didn’t’ have problems with TE before, I’ve been trying to figure what I’m doing differently now, or which exercise am I doing wrong. After seeing your video I realized that the one thing I’m doing differently now than when I started 5×5 is that I’m emphasizing grip strength on every exercise. Even squats, which can be done without gripping the bar at all I’ve been applying the death-grip squeeze on the bar every time. I did this because I was trying to incorporate my whole body into every exercise, and because I figured that it would just increase my grip strength uniformly. After watching your video I’m going to try dialing back on the grip-strength, and perhaps re-setting to lighter loads. If you’re curious about my progression in the 5×5 program I’ve had a few re-sets along the way, but I’ve gotten up to 290 lb squats. Going forward I plan to pause the linear progression on each exercise as I find a weight where I can do all 5 sets with good form and just maintain that for a month or so before adding 2.5 to 5 lbs. If I need to lighten up a little bit or just stay where I’m at, so be it. My goal is to just be strong and counter the effects of aging, not to increase the weights all the time. I like what you said about how your goal is to just be strong and counter the effects of aging, and not to be so focused on increasing the weights all the time, Lee! I’ve had that mindset for the past decade as I’ve been working out, and I have avoided significant injury. I’ve only had the slightest “tweaks” and the worse injury I’ve had in the past several years (to my Biceps Tendon) came from overly aggressively pulling on the lettuce spinner handle and having the whole thing break as I was pulling super hard to get ALLLLL the water out of that washed lettuce. It took me over a year to recover from that bloody injury! Had to drop my Bicep Curl weight way down and work on my Bicep and its tendon regularly for a good 6 months. Why do you try to eliminate the use of machines in this video? Machines are great when dealing with injuries. I know plenty of guys that look a million times more muscular than you, but have gotten to the age when they rely almost entirely on machines. I hear Mr. Olympia competetors saying that they can’t win the contest with only machines, but I don’t think your listeners here are competing in international competition. Why are you talking about kettle balls and discussing dumbell versus barbell? Play if safe while still dealing with lingering elbow concerns and use machines. I think there’s a lot more to “playing it safe” than just using machines and avoiding free weights if that’s what you’re advocating. Yes, I’m not that muscular, but I’m not sure what your point is with that observation. I’m so glad I found your website! I am 46 and began a fitness program in February that involves using a rowing machine, free weights, treadmill and floor exercises. Within 2 months I developed a very painful case of tennis elbow . I’m almost certain I acquired it using the rowing machines as the range of motion and force used is pretty intense. I tried to nurture the tennis elbow by eliminating the rowing machine and reducing the amount of weight I’m using and modifying certain floor exercises. However, I was still doing all of the exercises you say to avoid here. The pain continued and throbbed all night, leaving me unable to sleep. I finally decided to eliminate all exercises that use my arms, wrists or gripping. Things are starting to get better!! My question is: When I feel like there is no longer any pain, when should I resume my normal exercises. I’m afraid to re-aggravate the TE and don’t want to jeopardize the injury. However, very anxious to get back to a regular routine. I would love to have your opinion on this! Thank you.